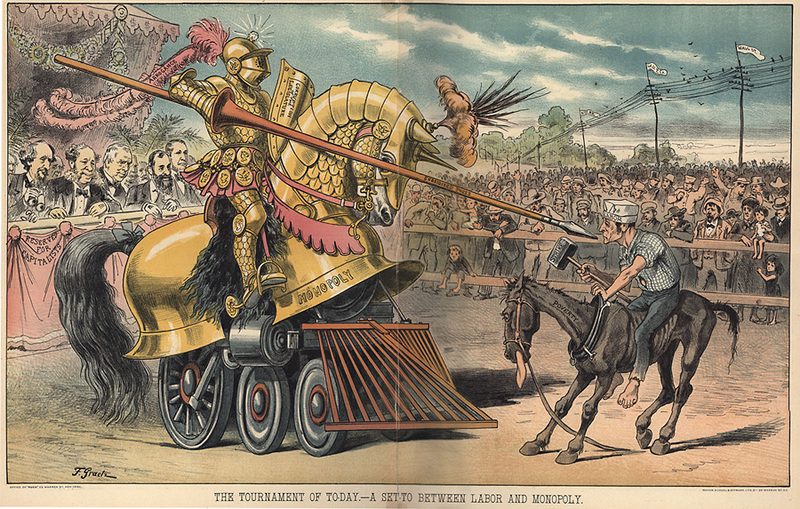 This 1883 cartoon from the satirical magazine Puck imagines a medieval-style joust between working people and the industrialists and railroad owners who largely controlled the U.S. economy in the late nineteenth century. The spectators in the section of the audience marked "Reserved for Capitalists" include railroad company owners Jay Gould and William Henry Vanderbilt. Source | F. Graetz, "The Tournament of Today - A Set-to Between Labor and Monopoly," chromolithograph, Puck, 1 August 1883, available from Georgia State University Library, http://www.library.gsu.edu/spcoll/pages/pages.asp?ldID=105&guideID=510&ID=4223. Cite This document | F. Graetz, “"The Tournament of Today - A Set-to Between Labor and Monopoly",” HERB: Resources for Teachers, accessed April 20, 2019, https://herb.ashp.cuny.edu/items/show/665.